When Emily took me to visit Dynamo Donuts, on the way back passed by Humphrey Slocombe Ice Cream. I’ve heard of Humphrey Slocombe several times (it’s one of the most yelp-ed places on the planet, and has gotten exposure on several TV shows), and it’s been a place I’ve been wanting to try. However, they don’t open until noon, so I had to make it a point to come back later. But after visiting Mission Cheese earlier in the day, I decided that a good walk was in order, and went on a pleasant little hike up to Bernal Heights Park, through “downtown” Bernal Heights, and then coming back to the Mission by ealking around the park. This route very nicely passed me by Humphrey Slocombe again, so I decided to stop in and give them a try. 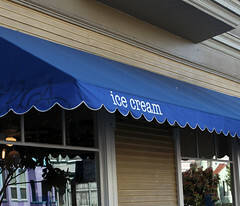 Ducking into their extremely unassuming store front (there’s a subtle sign on the window, and a plain blue awning that says, simply “Ice Cream”), you emerge into a simply-decorated ice cream stand with two small freezer cases of ice cream. Your basic ice cream shop. But when you start looking at the flavors, you can tell that this isn’t your typical ice cream stand. The flavors are geared toward the adventurous palate, with all sorts of inventive flavors. When I went, the selection include Vietnamese Coffee, Butter Beer, Malted Dulce de Leche, and Toasted Almond. Oh, and their most famous flavor, “Secret Breakfast”, which is flavored with bourbon and corn flakes. Yes, you read that right. So I decided that it was worth a try, and got a small cup of both Secret Breakfast and some Vietnamese Coffee. Well, I rather enjoyed the inventiveness of the Secret Breakfast Ice Cream; it was a nice combination of bourbon flavors (none-too-subtly applied) with just a little crunch from the corn flakes. Enjoyable, and the tastes all complemented each other. It’s definitely a unique combination, and quite a pleasing one at that. But I was really bothered by the mouthfeel of the ice cream, since it left a really heavy, greasy film on my mouth. Usually, this means it was overchurned and the fats start to agglomerate. Very disappointing, since it degraded what should have been an excellent ice cream to a merely good one. 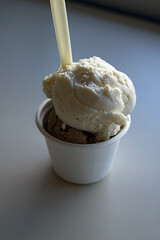 I would have been tempted to write it off as a bad one-off, but my Vietnamese coffee ice cream was even greasier. So while they get an A for inventiveness, they get a C- for the actual execution of making a good ice cream. Sorry, but I expected better. 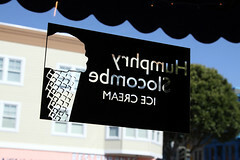 So, overall, I was disappointed by Humphrey Slocombe. At least for my visit, they seem to have spent just a little too much time composing odd flavor combinations, and not enough time actually producing good ice cream. I will probably check them out again, however, to see if sometimes they hit more than they miss.